Our Yorkshire pudding recipe is foolproof, and it’s cheap, quick and easy. It’s also super tasty and is an absolute essential for your Sunday roast. Nothing beats a good old Sunday roast. 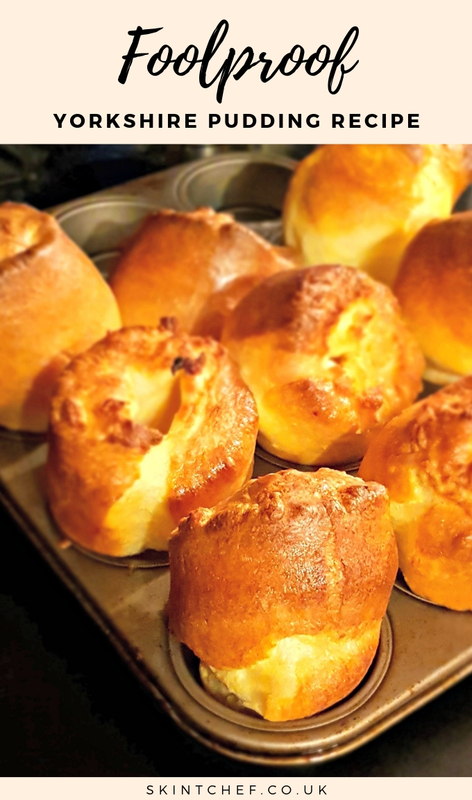 And to make the dinner the best, you need a delicious, fluffy and light Yorkshire pudding (or two). Yes, you can buy frozen Yorkies, but they are expensive. There is no reason not to make your own because it’s so easy. For the full list of ingredients and printable instructions, please see the recipe card at the end of this post. But, before you scroll straight there, take a look at the more detailed “how to” just below. 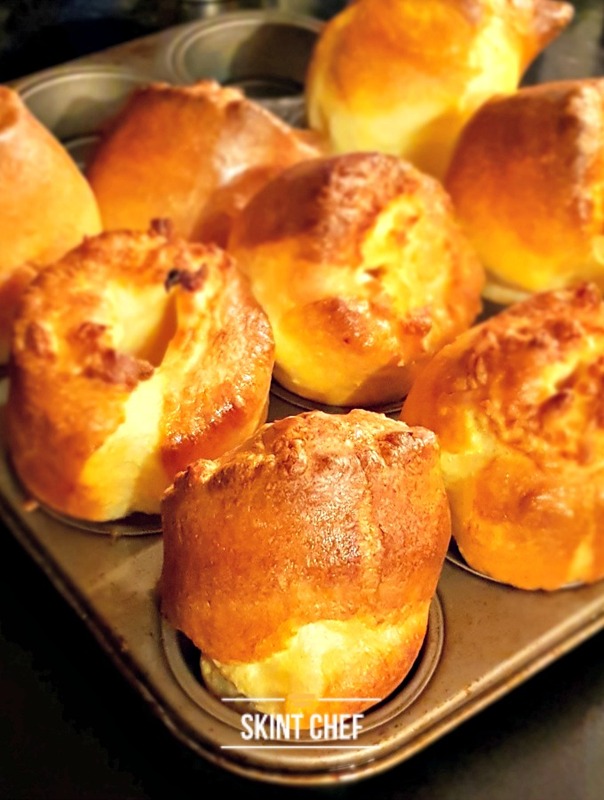 Everyone can make perfect Yorkshire puddings. Yorkies need basic store cupboard ingredients that most people will have in, so there’s no reason not to at least try them. Because they are super quick to cook, you don’t need to worry about timings too much. If you’re having a Sunday roast, once you’ve taken your meat out it’s time to crank up your oven and get your Yorkshires cooking. There are a few things to get your batter ready and a couple of things to keep in mind to get it right. You must have a HOT oven. When I say hot, I mean hot, hot! You need to have a preheated oven at 215 °C; you need to preheat your non-stick Yorkshire Pudding tray and have hot oil too. Having a hot oven will make sure your Yorkshires can cook perfectly. 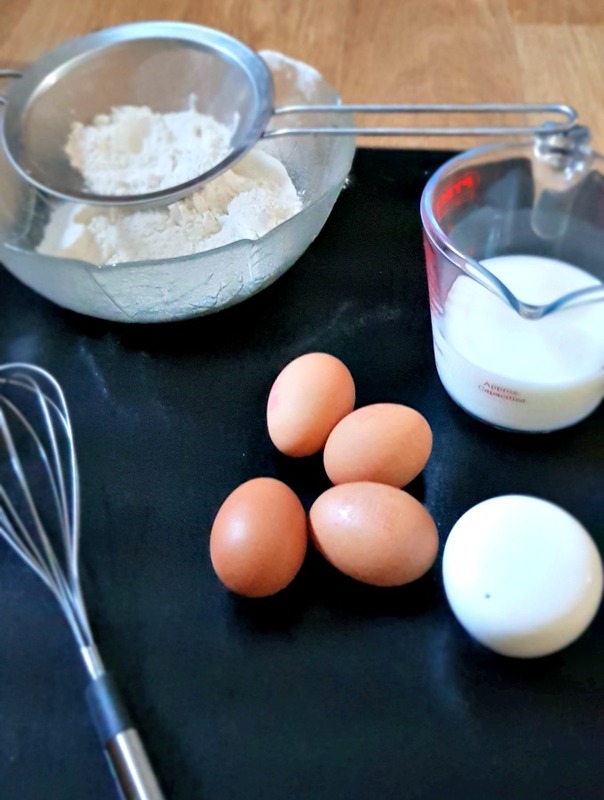 The batter is a simple mix of flour, eggs and milk. You can whisk it by hand or use an electric mixer. It doesn’t really matter how you mix it, but you need to batter to be very smooth. That’s why it’s best to sieve your flour. You’re aiming for the batter to run off the back of a spoon and have a lovely glaze to it. You need to make sure your Yorkshire batter has some time to rest. Once you’ve got your batter made, try to leave it alone for at least 30 minutes. If you can leave it an hour, or even overnight, then it’s better. Allow it to rest covered in the fridge, although it doesn’t matter too much if it’s really cold before you cook it. The longer you can leave it, the better your Yorkshire puddings will rise, and you will get a better texture when they’re cooked. 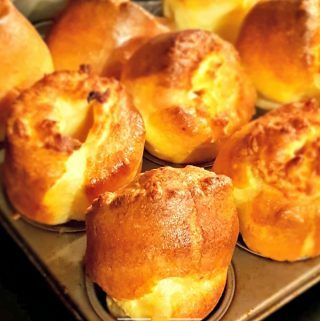 Can you make Yorkshire puddings in advance? Absolutely, you can make Yorkshire puddings in advance. 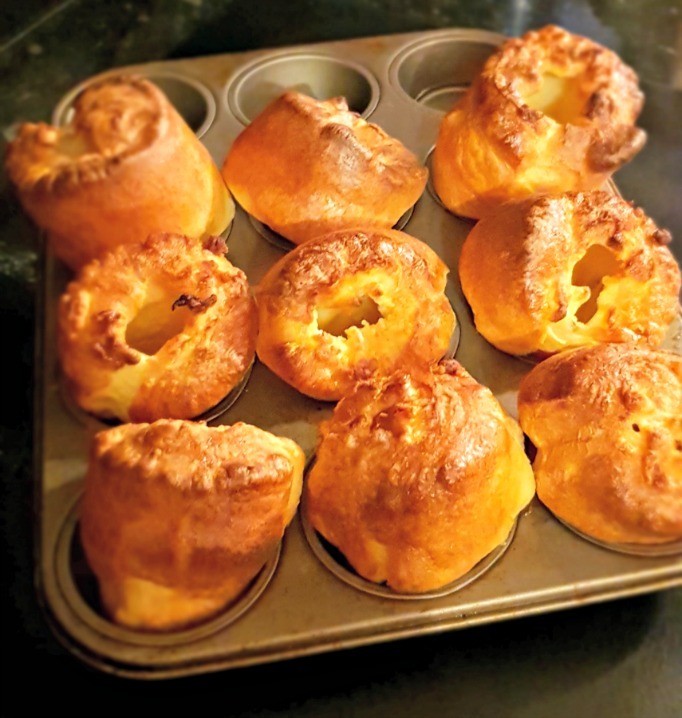 Make your batter and cook your Yorkies as usual, then allow them to cool completely on a cooling rack. Once they’ve cooled down, pop them into a freezer bag or freezer-proof container and they can freeze ok for a month. Just remember to add a date, so you know when you need to use them up. When it comes to reheating them, place them in an oven heated to 200°C for 6-8 minutes. Subscribe today and receive new recipes straight in your inbox. We will never share, sell, or spam your email address. WANNA SAVE MORE MONEY ON YOUR SUPERMARKET FOOD BILL? Come and join our Facebook community, Reduce Your Supermarket Spend. Come and join thousands of people who share their best tips and real-life ideas to keep your costs down. This is now the biggest supermarket community on Facebook! Preheat oven to 215 C. Sieve the flour into a large bowl and add the eggs, milk and salt then whisk until you have a smooth batter. Set to one side. Put 1 teaspoon of sunflower oil in each compartment of a Yorkshire pudding tray and place into the oven for 10 minutes. 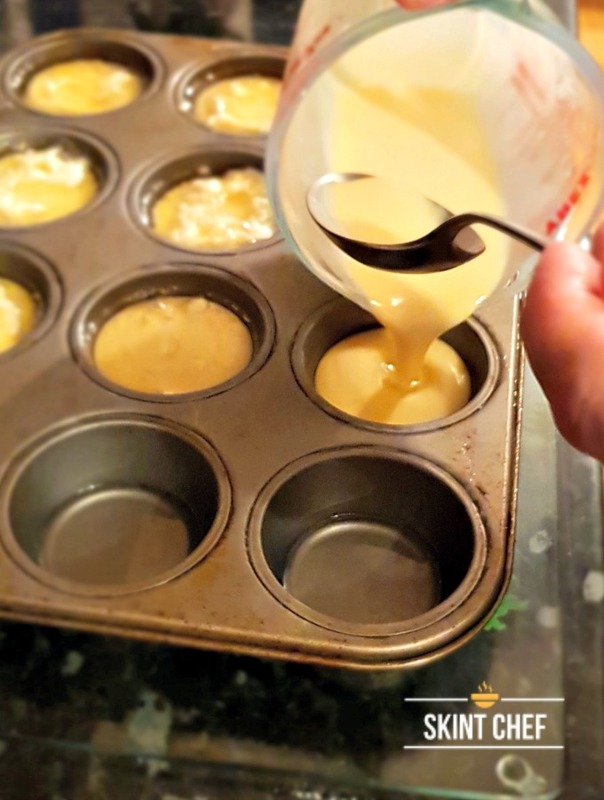 Once the tray is heated remove from the oven and pour the batter mix into each compartment. Cook on the middle shelf for 15 minutes. Figures are correct at the time of calculation. Prices are based on a generic, mid price range supermarket, choosing their own value brand. 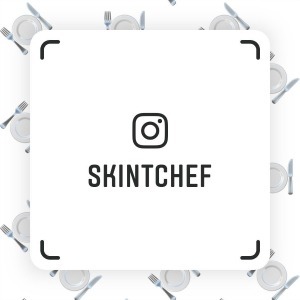 Tried this recipe?Mention @skintchef or tag #skintchef!